Thanks for all the likes, shares and comments on our previous article in which we identified Net Points per Raid (NPpR) as a potent metric to evaluate raiding performance. Following up on that article, we have come up with another similar metric which not only allows us to compare different defenders but also attempts to compare raiders and defenders together using these two metrics. There are two major metrics to evaluate defenders: a) the number of tackle points, and b) the tackle success rate. Other metrics like High 5s are derivatives of ‘number of tackle points’ and can be ignored for the purpose of this analysis. Individually, each of these metrics gives meaningful insights but lacks a sense of completion. They leave the viewer asking for more. The problem with tackle points and high 5s is that they don’t tell us how many failed tackles went into achieving that many points while the problem with tackle success rate is that a high success rate might be because of a fluke on the very few tackles a player might have attempted. To allow for the conversion to points, let us convert the metric to Points per Tackle (PpT). In mathematical terms, the numerator changes from ‘Number of Successive Tackles’ to ‘Tackle Points’. PpT is expected to be very similar to tackle success rate. The difference in both metrics will only be because of the super tackles, which are a small proportion (~8%) of the defensive points. 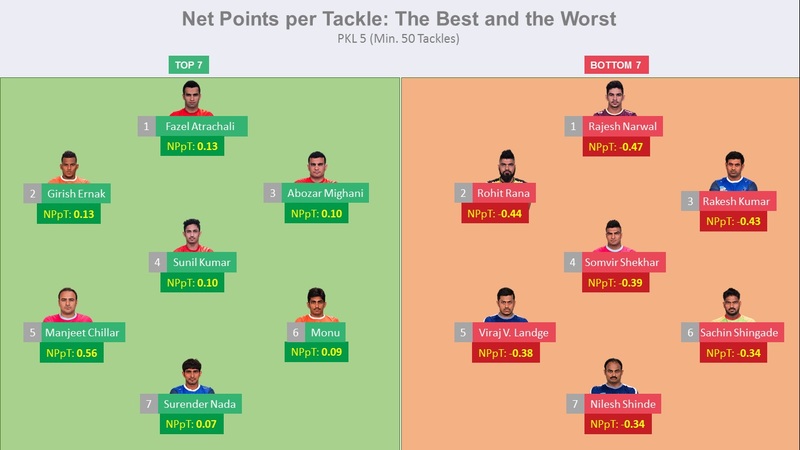 Image 1 shows the top and bottom players based on their Net Points per Tackle (NPpT) scores. Of the 46 players who conducted a minimum of 50 tackles in PKL season 5, only 11 players have a positive NPpT value. Fazel Atrachali tops the list for NPpT values at 0.13. He was also on top of the list for Tackle Success Rate at 0.55. This means that Fazel was successful in 55 out of every 100 tackles that he undertook and created a positive differential of 13 points on them. 3 out of the top 4 defenders hail from Gujarat Fortunegiants. This highlights that they constituted the meanest defence in PKL 5. Another interesting finding is that most of the players in the green half of image 1 are corners while most of the players in the red half are covers. Is this an indication that corners are more important to the team as compared to the covers? We’ll cover more on this in a future article. For now, let’s get back to the usage of NPpT. Directionally, the findings from both NPpT and Tackle Success Rate are very similar. Apart from a minor change in the order, the top 7 from both metrics are the same. This brings us to question the rationale behind the creation of a new metric. The true power of NPpT is unlocked when one looks at this metric along with the metric Net Points per Raid (NPpR). Together, these two metrics help us rank defenders and raiders on an even platform. Just to recap your memory, here is image 2 which shows the list of top and bottom players based on NPpR. As you can see, the top players based on NPpR get around 30-40 points per 100 raids while the top players based on NPpT get around 10 points per 100 tackles. Considering that raids and tackles have equal chances of occurrence, the point difference is startling. When we consider that the best raiders undertake 15+ raids while the best defenders undertake 5-7 tackles a game, the difference starts to broaden even further. Effectively, a good raider creates almost 10 times impact on a game as compared to a good defender. This, in no way, suggests that defence is less important than offense. What this suggests is that an easier way to build a strong team is to have a couple of strong firing raiders. 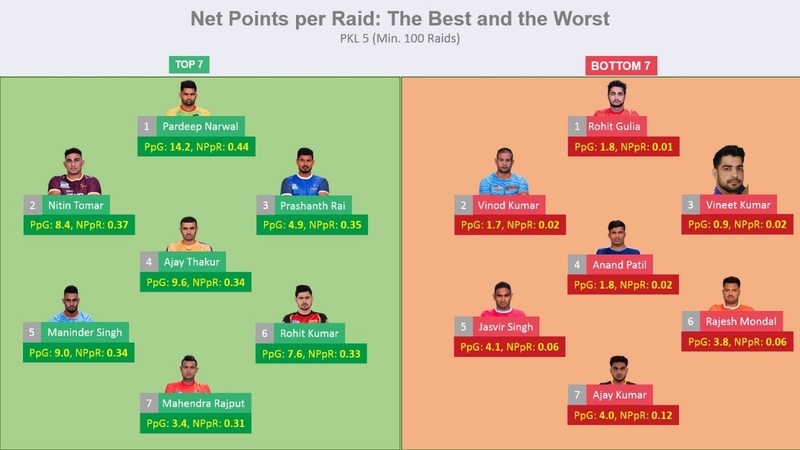 Looking at the successful run of the Gujarat Fortunegiants team from PKL 5, there’s an argument that having a good defensive setup can also be a good team strategy. True as it is, it is also important to note that you need to have 3 of the best performing defenders in the league for that strategy to work in favour of your team, and even then, you need the Sachins and the Mahendra Rajputs to play an able offensive role. We believe that the easier strategy to build a good team is to buy a couple of good raiders and watch them get on with their business. All in all, with a minimum tackles cutoff, tackle success rate is a good enough measure to rate players based on their defensive abilities. The Net Points per Tackle metric shows us that having strong raiders is much more important to a team’s success as compared to having strong defenders. As for identifying the best defenders, the metric affirms that the Irani duo of Fazel Atrachali and Abozar Mighani will be hot commodities in the upcoming auction. It also shows why teams chose to retain Indian talent like Girish Ernak and Sunil Kumar in their squads. We will continue to publish similar analyses in the coming days and weeks. In the meantime, please continue sharing your thoughts and/or suggestions. If you have any PKL related topic you want to read about, please drop a note in the comments section. This entry was posted in Kabaddi and tagged Kabaddi, Kabaddi Analytics, PKL, PKL6, Pro Kabaddi Auction, SportsKPI. Bookmark the permalink.